First time visitor to Chiang Mai might get a little frustrated with Chiang Mai’s transportation system. Compared with Bangkok, where there are excellent and modern public transport systems in place, Chiang Mai’s transportation is rather poor. The city has no public bus, MRT, BTS or other kinds of metro systems. The most common form of Chiang Mai public transport is called Songthaew, which is a converted pick-up truck with two rows of back benches. In Thai, the word “songthaew” literally means “two rows” (Pronounce: Song-Tail). A songthaew is also called Rod Daeng (meaning Red Car in Thai). The two rows of seats can fit between 8-10 adults inside, with the occasional mad-man choosing to hang off the back bumper with their bare hands holding onto the car. A Songthaew has no seat belts, nor any other safety equipment on board. Riding Songthaew like a local. Songthaews in Chiang Mai can be divided into 6 colours, namely Red, Yellow, White, Blue, Green and Orange colour. Different colour indicates different direction and route. Red songthaew is the most commonly found in downtown Chiang Mai because the other colours ply the routes going to the other town or provinces. 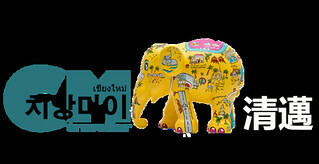 This article aims to give you an overview of the route and directions of the different colour songthaews in Chiang Mai. To hail a songthaew, simply stand at the roadside that has traffic going in the direction you’re heading to, and stick out your arm like you mean it to signal a songthaew to stop. If they keep going, most probably the songthaew is full (or being privately hired). Sometimes the incoming songthaew will horn when the driver sees you on the sidewalk. Just signal to them if you need their service, and they will happily stop. When a songthaew stops, just tell them the place you want to go. Songthaew drivers don’t usually understand English very well but there should be no problem getting to some popular tourists destinations (or the well-known hotels/restaurants) in Chiang Mai. The driver is likely to respond to you by nodding for yes or shaking his head saying no. If he says yes (usually with the fare), hop in the back. If he says no, don’t worry because the next one will be coming to you in seconds. The red songthaew is also known as the red car, red taxi or red truck. The moment you arrive in Chiang Mai, either by flight, train or a bus, you will notice there are loads of this red songthaew in the city. They can be found everywhere because they go everywhere within the city limit. Red songthaew roams around Chiang Mai without a fixed route. The fare usually starts from 20 Baht for a very short distance, and should never exceed 100 Baht because that’s the price range of a private tuk-tuk or taxi already. How fast you arrive at your destination depends on how many passengers the songthaew carries and where are they going to. Songthaew driver makes money by the volume of passenger and will pick up as many people as he can along the way. He will deviate a little from the route to drop off passenger if he needed to. So don’t be surprised if your 15 minutes short journey is stretched to a 30 to 45 minutes long distance ride. If you are running late to catch your flight, don’t use songthaew to the airport. Take a taxi or Uber instead. A red songthaew can be privately hired like a taxi. In Chiang Mai, some songthaew can provide taxi service, meaning your own private ride going to any location you want. You may sit next to the driver’s seat with air-conditioning while enjoying music from the car stereo. However, this is upon request and the driver will agree only when there is no other passenger in his songthaew. The fare, of course, will be higher than usual but is still cheaper than a regular taxi. And be noted that sometimes it’s not easy to find a taxi in Chiang Mai but songthaew is always around. Use Grab RodDaeng to call for a ride at your fingertips. Another way you can call for a red songthaew in Chiang Mai is by using GRAB RodDaeng, which works just like UBER. To use this service you must first install a ride-sharing app called GRAB on your mobile phone. Once registered as a user, simply enter the pickup & drop off point and the app will show you the fare upfront. If you are OK with it, press the “book” button and the songthaew accepting your booking will come to your pickup point. Read here for more information about using UBER and GRAB RodDaeng in Chiang Mai. Hire a red songthaew and go everywhere in Chiang Mai city. Point of interest: Hang Dong district, San Pa Tong district, Wat Phra That Si Chom Tong, and transit to Doi Inthanon National Park, Mae Klang Waterfall, Wachirathan Waterfall. The orange songthaew plies the route from Chiang Mai to Fang district, where the beautiful Doi Ang Khang National Park is situated. The blue songthaew plies the route from Chiang Mai to Lamphun Province. The white songthaew plies the route from Chiang Mai to Mae Taeng district. White songthaew also goes to Doi Saket and San Kam Phaeng, which is the similar routes like the yellow songthaew. The green songthaew plies the route from Chiang Mai to Mae Jo district. As you can see, riding songthaew is really a cheap way of transportation in Chiang Mai. Chiang Mai is not a metropolis, and most people here rely on songthaew as the main public transport in Chiang Mai to travel daily to work, school, market, other villages etc. A question frequently asked by tourists is, “is there songthaew going from Chiang Mai to Pai?”. Well, the answer is NO. There is only van/minibus going from Chiang Mai to Pai, at 180 Baht each way. Another alternative is to ride a motorbike/scooter.